From April 2-8, 2013, I traveled to Honolulu, Hawai’i to present my research on the material culture of Indian mariners at the Society for American Archaeology Conference. While there, I spent two days in the Hawaii State Archives scouring customs records from O’ahu for documentary evidence of Indian mariners from the New England region. Almost immediately I found two Pequot mariners, Amos W. George and Sam Fagins, in the discharge records for “Foreign Seamen.” In addition, I located five Shinnecock mariners, Andrew Cuffee, Sydney Cuffee, Russell Bunn, Israel W. Kellis, and Moses Kellis. Exciting histories are emerging in the Pacific Ocean and Polynesia! 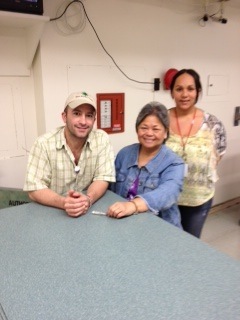 At the Hawaii State Archives with staff members Vicky and Darlene. This entry was posted in Uncategorized and tagged Amos W. George, Andrew Cuffee, Bark Nile, Hawaii State Archives, Honolulu, Indian mariners, Israel W. Kellis, Moses Kellis, New London, New London County Historical Society, Pequot, Pequot Museum, Russell Bunn, Sam Fagins, Shinnecock, Ship Electra, Sydney Cuffee, whaling. Bookmark the permalink.